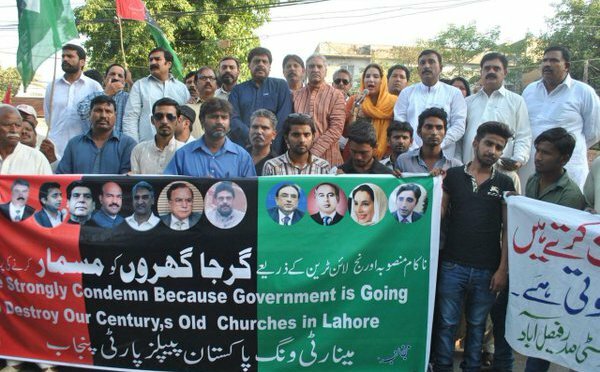 Pakistan People’s Party held a protest in front of the Lahore Press Club Saturday (today), against the Punjab government’s plans to take over the land of four churches in order to build the Orange Line Metro Train project. The protest was mainly organized by the PPP Minority Wing Punjab and led by Chaudhary Manzoor Ahmed, member organizing committee, and JahanAra M Wattoo, provincial leader of the party. The demonstrators demanded that the government review its plans, saying they would protect the holy places of the Christian community. They waved placards and chanted slogans against Punjab government. While terming it a controversial and show off projects, JahanAra M Wattoo said it has not only destroyed Lahore’s identity, its rich culture and made people homeless, but it is also destroying holy places of religious minorities that are a part of Lahore’s history and have been in place since before the partition. She maintained that the PPP governments were always considered as synonymous to pro-minorities and PML governments as anti-minorities governments, adding that it is very unfortunate that instead of protecting the properties, honour and lives of the minorities, the provincial government, is working to annihilate them. She demanded that the resources should be spent on health, education, clean drinking water and other basic public issues rather than wasting it on show off projects. The rally was also participated and addressed by Chaudhary Manzoor Ahmed, Sohail Malik, Naseer Ahmed, Imran Uthwal and others.